to cherish, maintain and extend the institutions of American freedom, to foster true patriotism and love of country, and to aid in securing for mankind all the blessings of liberty. 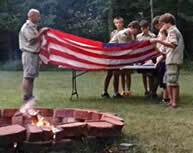 John Alden Chapter members have been collecting worn American flags during the past meeting year. 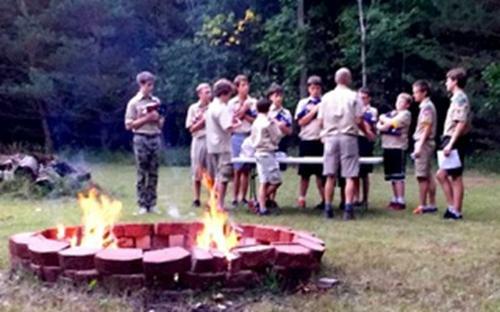 Boy Scout Troop # 763 invited our members to attend their flag-burning ceremony, which was held on August 30, 2015. The purpose of the Community Service Award, which is national, is to recognize worthy local citizens for outstanding achievements in educational, humanitarian, patriotic, historical or citizenship endeavors, or environmental conservation. The recipient is expected to have contributed to his or her community in an outstanding voluntary heroic, civic or benevolent manner and must not have received any remuneration for the services given. The award is presented locally but is received from the National Society Daughters of the American Revolution. Floyd Andrick, who volunteers in many historical preservation endeavors and has recorded many oral histories of veterans, seniors and descendants of First Families of Midland County. He also records Fireside Chats at the Midland County Historical Society, which he serves as a board member. Ron Beech, honored for his years of promoting patriotism and civic pride, his support of veterans and military personnel and his education of youth and adults about American history and freedom. 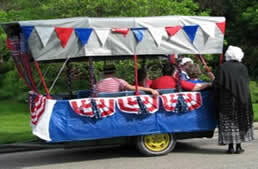 He arranges displays and parades and distributes U.S. flags, many at his own expense. Joe Bevirt, who has been instrumental in restoring, marking and maintaining the Midland to Mackinac Trail, a trail which had been used by Native Americans for hunting, gathering and trading for hundreds of years. The trail is inspected regularly and is available for public use. 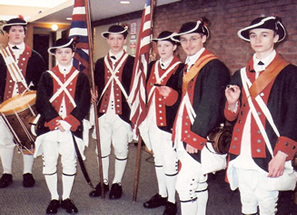 Jim McMahan, For more than twenty years, Jim McMahan, dedicated leader and "voice" of the Tittabawassee Valley Fife & Drum Corps, has shared his knowledge of the music and culture of the American Revolutionary era. Performances of the Corps are colorful and authentic, with musicians and color guard. MaMahan is an expert on flags of that period. Bill and Jane Kuhlman, founders of Jolly Hammers & Strings, entertain audiences with traditional music on dulcimer and autoharp, and share information about this art form. The Kuhlmans' leadership and enthusiasm have inspired performers throughout the Saginaw Valley. They are credited with starting the Folk Music Society of Midland and the Midland Dulcimer Festival. John Alden has a long history of supporting our veterans at Aleda E. Lutz Veterans' Hospital in Saginaw. Dedicated John Alden Chapter members have been visiting the hospital for many years. They would collect homemade cookies baked by chapter members and deliver the cookies twice a year, (until government regulations forbade taking home baked goods). Our chapter's goal of one hundred dozen cookies per trip was obtained for years. We were known as the "cookie ladies." Three hundred to four hundred comfort items, books, decks of cards, pencils, notepads, etc. along with many ditty bags are also delivered twice a year. 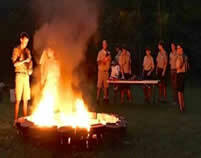 We also take handmade lap robes for Daughters of the Union. We send used postage stamps to a Veterans' Rehabilitation center for use in hand therapy. In that same spirit, we have supported our troops presently serving our country through the donation of gift cards to the Family Assistance Program of the Michigan National Guard made possible through our fundraising efforts. Officially called the Motion Picture, Radio, and Television Award, the purpose of the DAR media award is to recognize outstanding work that promotes DAR objectives: historic preservation, patriotism, and education. Two local history documentaries produced by Delta College QTV have received this award from John Alden Chapter. "Vanishing Voices of World War II" honored war veterans with compassion and appreciation, featuring interviews of survivors of that era. "Breaking New Ground: Women of the Saginaw Valley" highlighted the breakthrough accomplishments of women who paved the way for progress from the pioneers of the 1700s to modern scientists, educators, and industrialists. This committee was established in 1919 with a goal of developing better citizenship training for all persons living in the United States. The objective is to promote knowledge, loyalty, and love of country in the hearts and minds of American citizens, whether naturalized or citizens by birth. NSDAR began supplying the DAR Manual for Citizenship in 1921 to assist those studying for American citizenship. More than 100,000 copies are distributed annually. This organization was created February 22, 1895 and provides training in patriotism and leadership for children who are members. Boys and girls may be members from birth until they reach their twenty-second birthday, and eligibility is the same as for the DAR. The Constitution of the United States is the safeguard of our liberties and champion of our freedoms. The celebrations of Constitution Week (September 17 - 23) each year are to emphasize the responsibility of protecting and defending the Constitution and preserving it for posterity and to understand that the Constitution is our great heritage and the foundation of our lives. 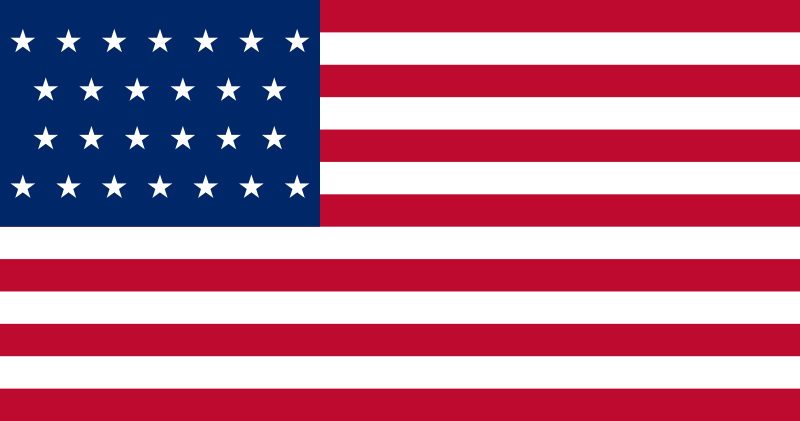 This flag became the Official United States Flag on July 4th, 1837. A star was added for the admission of Michigan (January 26, 1837) and was to last for eight years. The four presidents to serve under this flag were: Martin Van Buren (1837-1841), William Henry Harrison (1841), John Tyler (1841-1845), and James Polk (1845-1849). Find out more about the U.S. Flag.